How to Delete PUBG Account – PUBG game is immensly popular over the last few month. Most of the people are addicted to this game and started playing for hours and hours. So if you are also in the same situation and wanted a simple guide to know How to Delete PUBG account, you are in the right place. 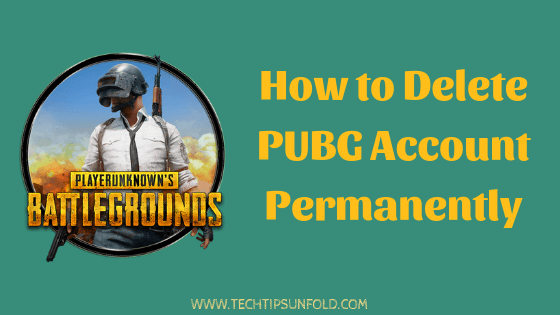 We will let you know the process to delete pubg account permanently in a step by step guide here. Continue reading for the details. You might be having different reasons to delete PUBG account. If you are thinking about the privacy issues, we have alternatives options other than deleting your account. If you are bored of playing it on your mobile, you can download the PC version for free here – Download PUBG for PC. However if you are still wanted to delete your PUBG account permanently, do check on the following precautions mentioned and then proceed with the delete option. Once you delete your PUBG account, all your data will be erased. If you want to play it again in the future, you have to start it from the scratch. If you are OK with these precautions, you can proceed on How to Delete PUBG account. However we even wanted to list down few other alternatives to deleting PUBG account permanently. How to Delete PUBG Account Permanently? Officially there is no simple option like Delete PUBG Account available either on Mobile App or PC version. You need to have some workaround to delete your account. If you have downloaded the official Windows version from Steam website, you need to contact their support team to get your things done. Don’t worry. We will list down the steps on How to Delete PUBG account in detail on your Android or iOS mobile. Now at the bottom right menu you will see gear like icon for settings. Click on that icon. On the left side you will get few menu options. Select Basic option there. Now you should be able to see linked Facebook, Twitter or Google play account there. If you want any privacy options, you can choose it from here. Find Customer Service option at the Bottom of the screen. Now you will get Help section with few question and answers. Choose any question that is related to account and when it asks for was this helpful? Click on No option. A chat window will appear with PUBG support team. Now you can ask the Customer support team to delete your PUBG account permanently. Now your PUBG account and data will be deleted after 7 days. If you’ve deleted your account by mistake and wanted to retrieve it back, just login to your account and cancel the deletion process within 7 days. Alternatively, you can just logout of your account and uninstall the app for now. So for the next time, whenever you wanted to play the game with the old profile, you can just login with your previous account and continue to play. If your account was linked to any social media accounts, you can recover it later by logging in back with the same social media account at the login screen. To get all your previous achievements, do login with the same account which you used previously. Else if you have used Guest account earlier and would like to recover it now, you can contact customer support team to recover your lost account. As soon as you install the PUBG Mobile Game on your mobile, it will asks you to connect to Facebook / Twitter / Play Games or Guest Account. Once you have connected to any of these social media or Google Play accounts, it’s not that simple to delink the already connect account and link to another account. Now try to link the PUBG game to Google Play games account again. PUBG game data is synced with devices. That means if you login with same account, you can get the same data and achievements in both Android and iOS mobile phones. How to delink PUBG Account with Facebook? You remove or delink any apps that you have linked to your Facebook account, you can follow these listed steps. Open your Facebook account and click on the top right drop down like icon from the News feed. Finally click on Remove option to delink PUBG account to your Facebook. You can do follow the similar steps to delink PUBG Mobile account to Google Play account or Twitter account as well. PUBG is the most popular and trending game on the universe currently. Millions and millions of people around the world have addicted to this game. PUBG has attracted the gamers with it’s stunning features and graphics. There may be few disadvantages as well to play this game for hours. Hence we have listed down the steps to Delete PUBG account permanently from your phone. I’m wrapping up this article on How to Delete PUBG account in a simple way. If you have any queries regarding the process, do let us know through comments. We will be glad to help you out. Cheers! i have tried to delinked facebook account linked with pubg, but still it is linked..